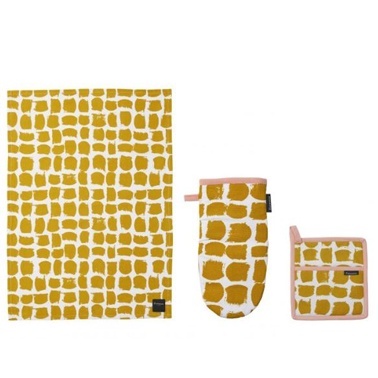 From the 200 year old Finnish textile manufacturers Finlayson, comes this fun yet stylish kitchen accessories set in yellow, pink and white. The set includes a teatowel, oven glove and pot mit. Finlayson are a responsible brand working hard on sustainability and running their organisation in an environmentally friendly and ethically kind manner. They also pride themselves on producing products that will last, not end up in a landfill.